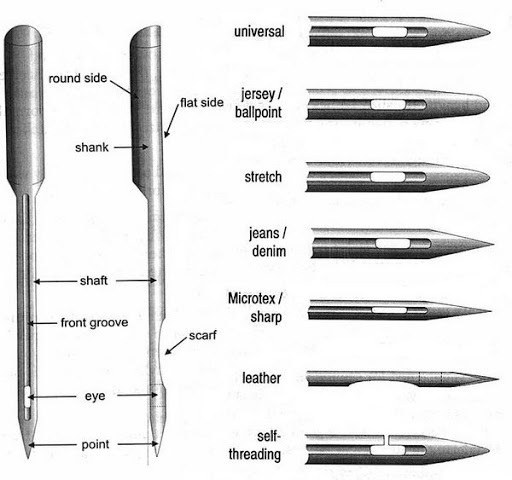 In readymade garments industry, sewing needle should be selected according to the types of fabric and sewing thread. Perfect needle selection helps to achieve better output from the sewing section. The size of sewing needle is expressed differently by the manufacturers but metric size is the simplest and widely used in garments manufacturing sector. In shortly, sewing needle size is denoted by Nm and is expressed by measuring the diameter of the middle of needle blade. Effects when the needle is finer than required fabric. When the sewing needle is finer than sewing thread then the thread cannot move easily through the needle eye and thread will not take position accurately at the needle long groove. As a result more heat will generate on the needle for higher friction which ultimately results the thread breakage and garments production loss. When the thread is finer than sewing needle then it may produce slipped stitch as the needle can’t create perfect size of loop. When the sewing needle is coarser than required fabric then fabric will be looked odd due to the larger hole. Here, seam puckering may produce on woven fabric. When the sewing needle is finer than required fabric then the sewing needle will deflect and become curve with the action of the throat plate. This type of curve needle will produce slip stitch as the looper may not catch the loop needle thread.